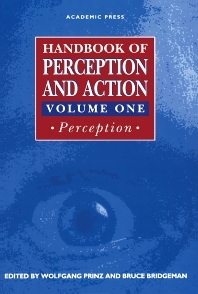 This volume combines the classical fields of perception research with the major theoretical attitudes of today's research, distinguishing between experience- versus performance-related approaches, transformational versus interactional approaches, and approaches that rely on the processing versus discovery of information. Perception is separated into two parts. The first part deals with basic processes and mechanisms, and discusses early vision and later, yet still basic, vision. The second covers complex achievements with accounts of perceptual constancies and the perception of patterns, objects, events, and actions. W. Prinz and B. Bridgeman, Introduction. A. Reeves, Temporal Resolution in Visual Perception. L. Kehrer and C. Meinecke, Perceptual Organization of Visual Patterns: The Segmentation of Textures. M. Eimer, Stereoscopic Depth Perception. W.X. Schneider, Neural Networks and Visual Information Processing. H. Deubel, Visual Processing and Cognitive Factors in the Generation of Saccadic Eye Movements. B. Bridgeman, Extraretinal Signals in Visual Orientation. W.L. Shebilske and A.L. Peters, Perceptual Constancies: Analysis and Synthesis. D. Deutsch, The Perception of Auditory Patterns. J. Hoffmann, Visual Object Recognition. R.E. Shaw, O.M. Flascher, and W.M. Mace, Dimensions of Event Perception. J. Stränger and B. Hommel, The Perception of Action and Movement. Chapter References. Subject Index. University of California, Santa Cruz, U.S.A.